Cloud is the most important tool in your company's arsenal to combat shadow IT. With digital innovation becoming the main driver for growth, the way your IT department operates is critical. In order to stay relevant in an ever more digital future, you need to take a look at Shadow IT within your company. You’d be surprised about what you can learn. If your employees are using tools that aren’t approved by the IT department, chances are something is wrong with your IT policy. The use of unapproved tools and apps is called ‘Shadow IT’. 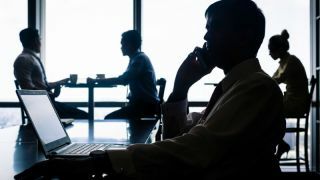 Almost every modern organisation today is confronted with some form of shadow IT: employees might be using their own Google Drive or Dropbox to make files available off-site, or they’re using a private license of Microsoft Word Online to write copy. In and of itself, shadow IT isn’t bad. You could look at the phenomenon as feedback from within your organisation, telling you there is a problem with the way you’re implementing business technology right now. Employees are always looking for the most efficient way to perform their tasks. If they feel the need to use their own apps, that means you’re not providing them with the right tools. There are of course legal side effects to allowing shadow IT to fester. Imagine a well-meaning employee backing up a spreadsheet containing identifiable personal data to his Dropbox. Despite your best efforts, your company is all of a sudden no longer in compliance with GDPR legislation. You’ll potentially also lose security control of the data, and there might even be some licensing issues. Shadow IT therefore needs to be addressed. There are three ways of doing this. The first is restrictive: your employees have chosen the path of least resistance to do their jobs in the most efficient way possible. You can close that path, and make the use of company software mandatory. Your employees will lose tools they have come to rely on, be less efficient and less happy, while you will need to control and manage their workflows more intensely. This is obviously a very bad idea. You’re far better off handling shadow IT at its source. The very existence of the issue is a sign of the times. Not too long ago, IT was responsible for selecting hardware and software, and pushing both to users. Today, employees expect technology at their workplace to be at least on par with the tech they use at home. In practice, they decide what tools are best or fit for purpose. As a company, you may attempt to react to and learn from the software employees are using. This, in fact, means you’re playing catch up. If you’re only starting to consider a cloud platform for file sharing when everyone in the organisation is already using OneDrive or Dropbox, you’re losing valuable time. A reactive approach is better than a restrictive one, but in time you’ll notice you’re getting left behind by other, more agile companies. A modern IT policy starts with the employee. You need to know the employee journey, from the moment they wake up in the morning until they turn in for the night. What do they need, why, and how can you address those needs? Do they want to work on the go? Do they like to check emails on their mobile? Integrity is the next logical evolution of security. As soon as you’ve given your employees the tools they need to perform, you should think about protecting the integrity of your organisation. A big wall around the IT infrastructure just won’t cut it anymore. Today, data needs to be at the center of your security solution. By managing who can use data, when, where and how, you can offer a far wider range of applications to your employees. As long as the data is protected, it doesn’t matter that there is a whole bunch of different applications on different platforms using it. Any CIO thinking that they have all the answers, is destined for failure. It might not be intuitive for a C-level manager to admit they don’t know it all. Nonetheless, talking and listening to your employees is not a weakness, but a strength. Ask them about the tools they think they need, and incorporate those in your IT policy. They are the ones that will be using new applications, so why wouldn’t you ask them what they want and when they need it? Don’t be afraid to set up a cloud-powered pilot project to try out something new. Worst case scenario: it doesn’t work out and you need to try something else. IT is more flexible than ever, and you should use that to your advantage. The golden rule is to innovate. But make a conscious effort to fail quickly and cheaply if it doesn’t work. To combat shadow IT, the most important tool in your arsenal is the cloud. The cloud is not a place. It is a methodology to deliver business technology. Use it to roll out platform-agnostic applications. These applications offer the same user experience on Windows, Mac, Linux, iOS and Android. This empowers your employees and allows them to use the hardware and OS they like most. By making the right apps available, you’ll allow everyone to use the workflow they know to be the most efficient, while still maintaining control. The key here is to ensure the same application functionality on any platform. That requires a workspace strategy, not a desktop one. The amount of control workspace working offers, goes far beyond anything you might use today. Imagine a bank with a BYOD policy. Employees could use a platform-agnostic app to access sensitive data on their device while at work. As soon as they leave for home, the data is automatically deleted or access is limited or revoked. By leveraging the cloud and implementing security on a software level, you’re able to give employees a mission-critical app on their favorite device, which allows them to be more productive. They won’t resort to using unsafe third party apps, because you listened to their needs and enabled them with a safe and powerful alternative. By innovating alongside your employees, listening to their needs, and going the extra IT mile, you’re not only making them happier and more efficient - you’re preparing your organisation for a bright digital future and a clear path to business innovation.